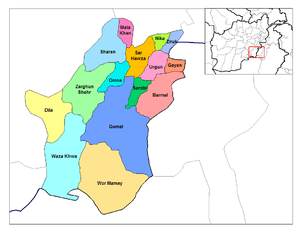 Paktika (Pashto: پکتیکا) is one of the 34 provinces of Afghanistan. It is in the south-east of the country. 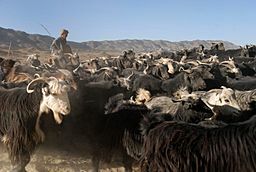 Most of the people are Pashtun. Its capital is Sharana. Local Afghan children observe U.S. Army Special Forces and Afghan National Police as they patrol the area to improve security and increase stability in the village of Rabat. Paktika Province Facts for Kids. Kiddle Encyclopedia.